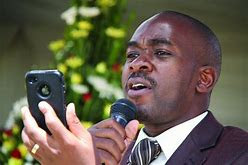 MDC-ALLIANCE leader Mr Nelson Chamisa who is desperate to shrug off stiff competition from secretary-general Mr Douglas Mwonzora in the forthcoming congress last Wednesday presided over provincial elections in the middle of the night in the Midlands province. The presence of Mr Chamisa and his ally, Mr Tendai Biti in Gweru was viewed as a ploy to influence the outcome of the elections, and soon after the winners were announced, the new provincial leadership nominated Mr Chamisa for party presidency ahead of the congress where elections for national office bearers will be held. Mr Chamisa’s long time ally and Gweru Mayor Councillor Josiah Makombe is now the new provincial chairperson for Midlands South Province. Clr Makombe, who was being contested by Mr Davis Shoko garnered 878 votes while his rival got 542. Mr Cleopas Shiri who was also vying for the same post chickened out at the last minute. Clr Makombe will be deputised by Mr Sydwell Bhepe. Other elected leaders to the main wing include Messrs Lazarus Chacha, Livingstone Chimina, Lloyd Mkapiko and Takavafira Zhou who grabbed the secretary, treasurer, provincial organ and information secretary posts respectively. Ms Cathrine Gosho will chair the provincial women’s league while Ms Sekai Marasha won uncontested to be the youth league chair. “Party president Nelson Chamisa was there at the elections that were held at midnight on Wednesday. He was accompanied by Tendai Biti. We suspect that they wanted to ensure that the elected members are inclined to them because we are going for an elective congress soon,” said a party member. Soon after the elections, some of the party members raised concern over the exclusion of women in the provincial executive. Ward 4 councillor Catherine Mhondiwa said it was worrying that women were not being represented in the provincial executive. “We are not happy as women because the whole executive members are men. We feel sidelined. Why were women not allocated their portion or slots in the executive and they compete for those positions on their own?” she said. Clr Makombe dismissed the allegations that the elections were manipulated. “In every election people complain. So what people should do is to graciously accept defeat and move on. Everyone in the party has one president Advocate Chamisa, so when people say Chamisa’s people were voted into the executive it means they are not MDC-Alliance because Advocate Chamisa is the president,” he said. Clr Makombe said women will fill other positions that are not voted for in the executive.